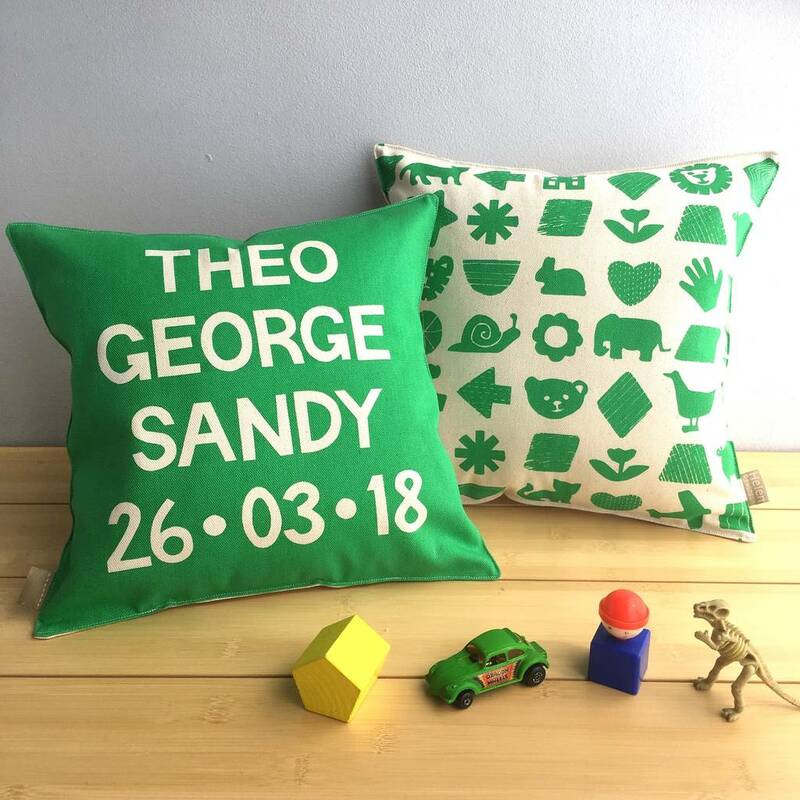 A happy little cushion complete with your child's name, birthday and favourite character, screenprinted by hand in a choice of colours for boys and girls. 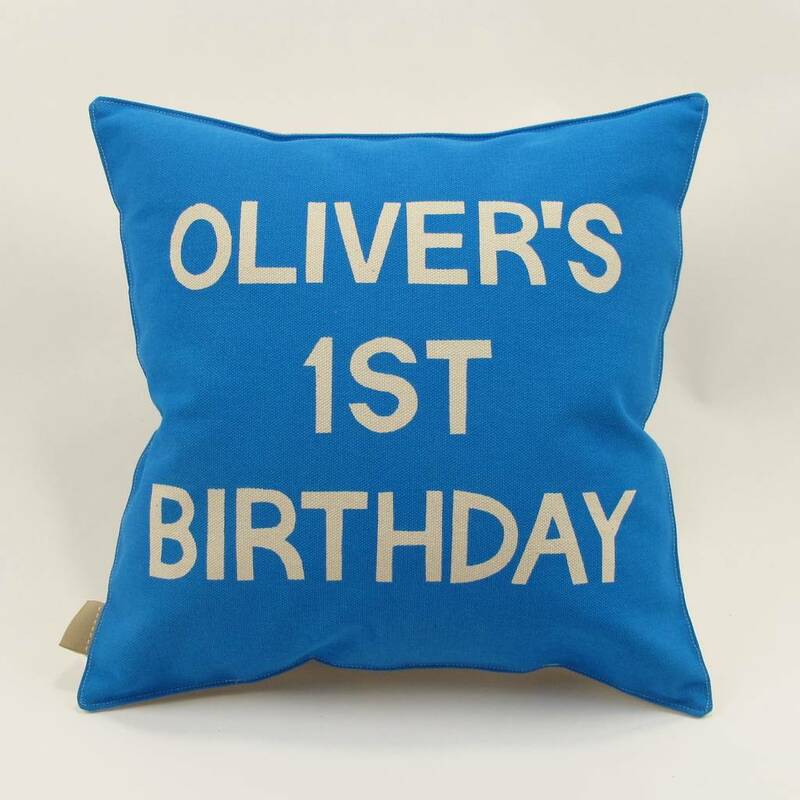 A lovely gift for a new born baby, birthday or christening present. 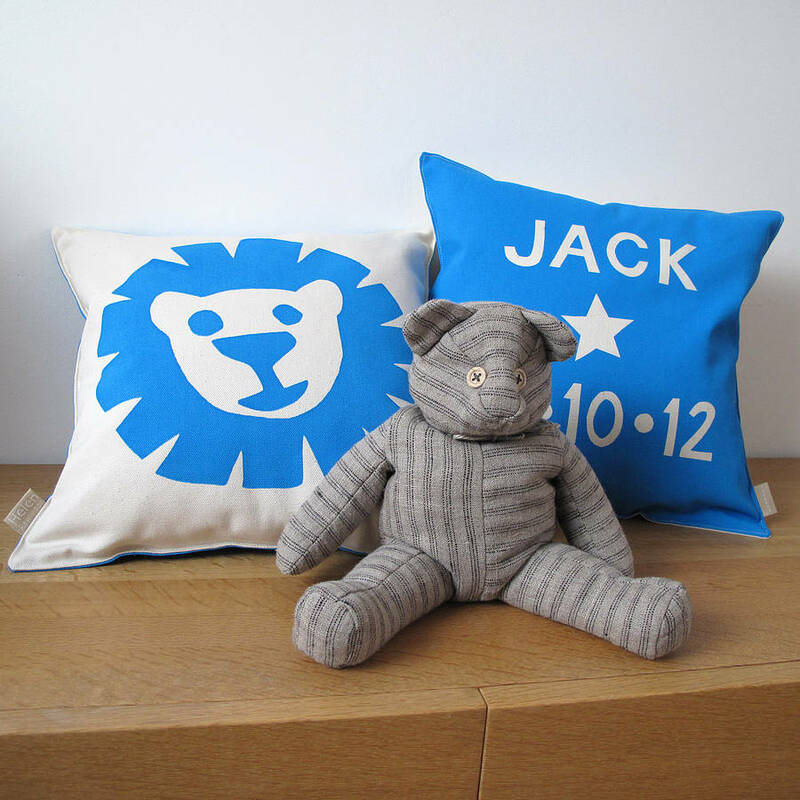 These fun little cushions would make a special keepsake and take pride of place in the nursery or bedroom. 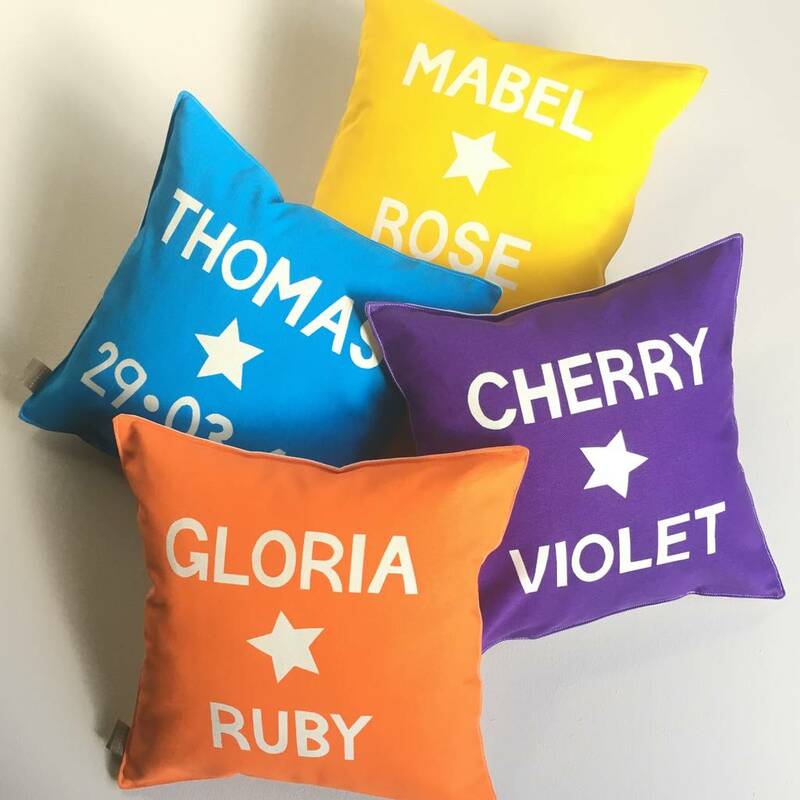 With four lines to work with, adding a full name, date and even a baby weight - they are perfect for newborn gifts or simply choose a name and a star for birthdays and special dates for your little one. 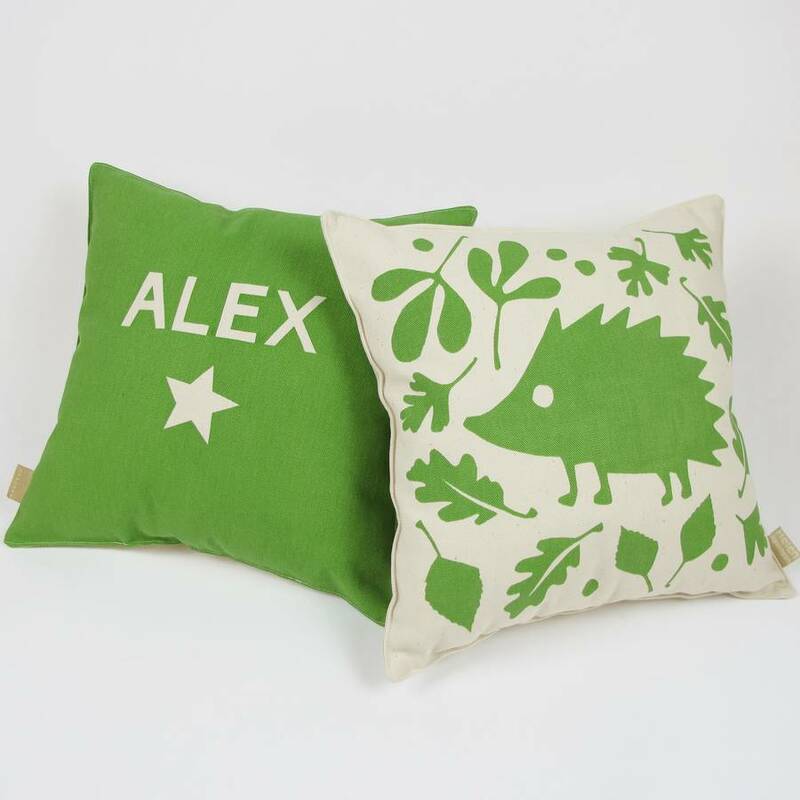 Each cushion is individually screen printed by hand and made in our London studio. 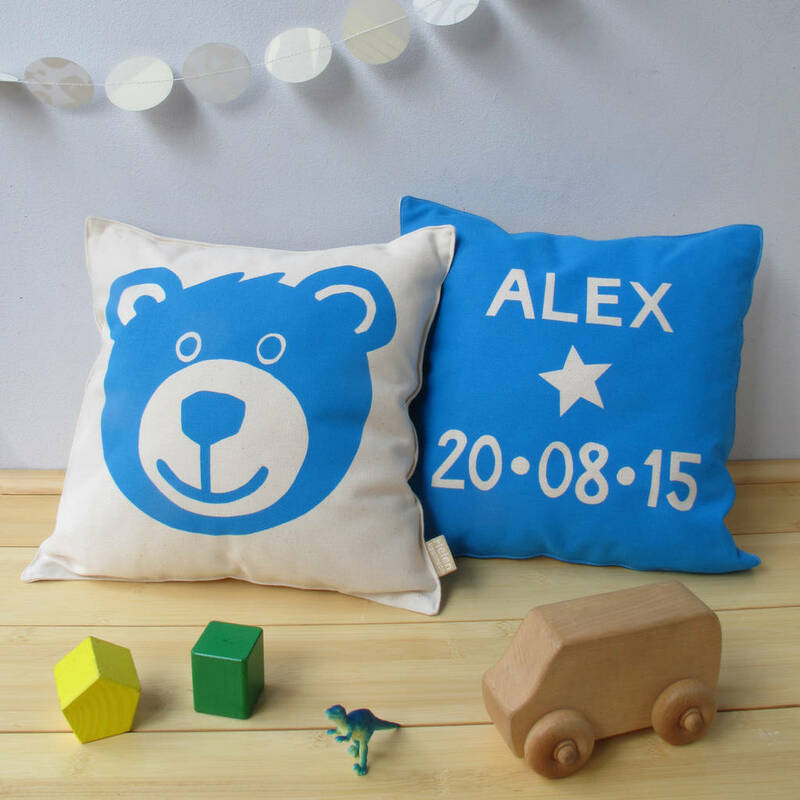 A variety of loveable animal characters to choose from for the front or an all over pattern of shapes and fun favourite things. Use the options on the right for your character and colour choice - aqua blue, candy pink, purple, orange, red ,yellow, black, olive green or bright green. 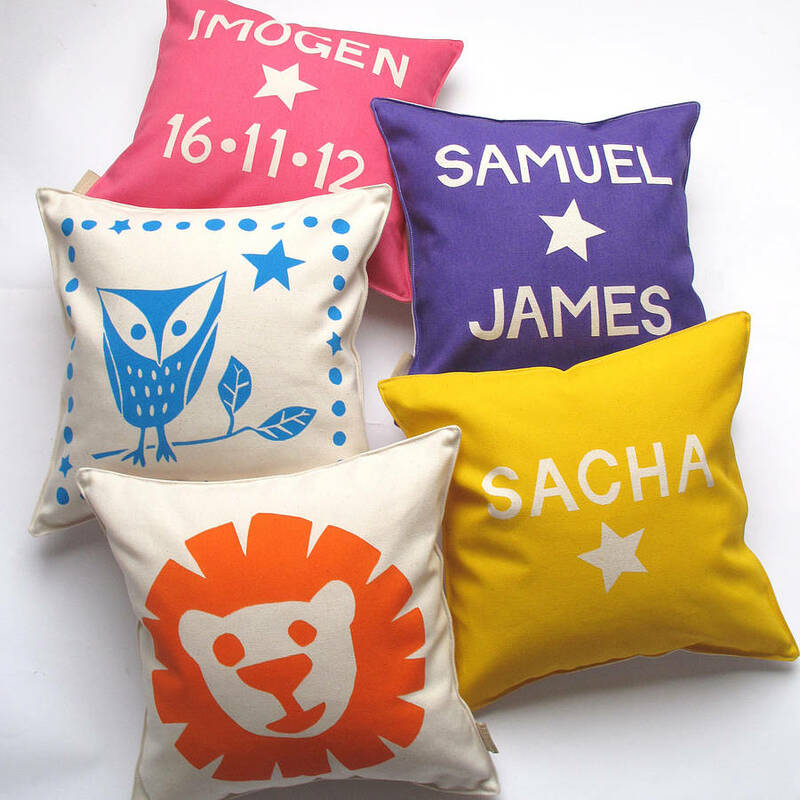 If you'd like another colour, please send a request via the 'ask seller a question' button. First name and just a star. Maximum of 9 letters per line. Dates will be written as 07.10.18 format. Use * to indicate a star. Any lines not required - please leave blank. 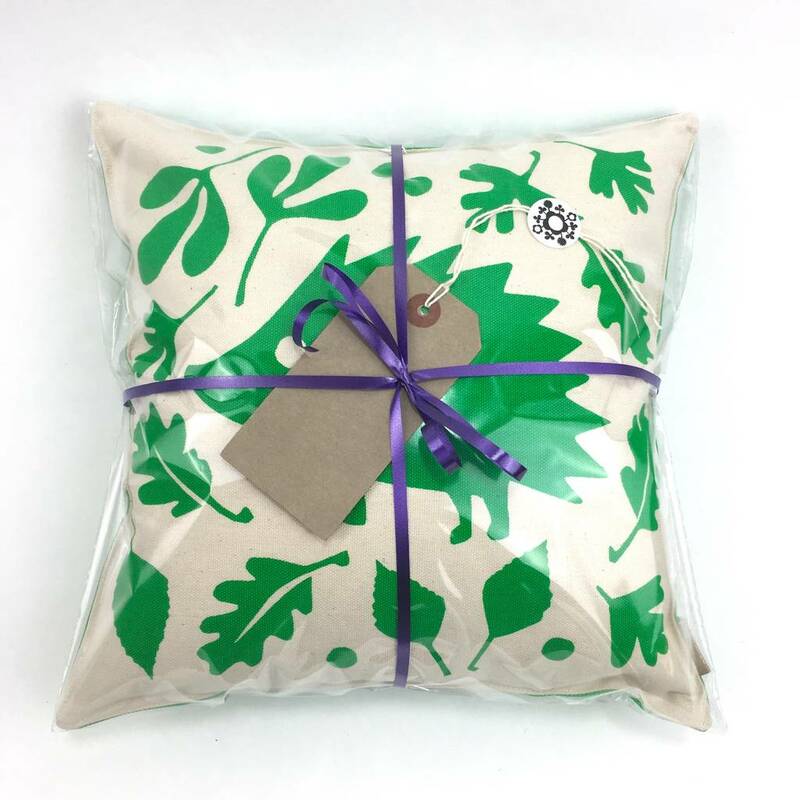 Your cushion will be wrapped in a cellophane bag with curly ribbon tie and manilla tag, ready to write your own message and present as a gift. If sending straight to recipient - tick gift wrap request for additional tissue paper wrap and add a personal note with a gift receipt. 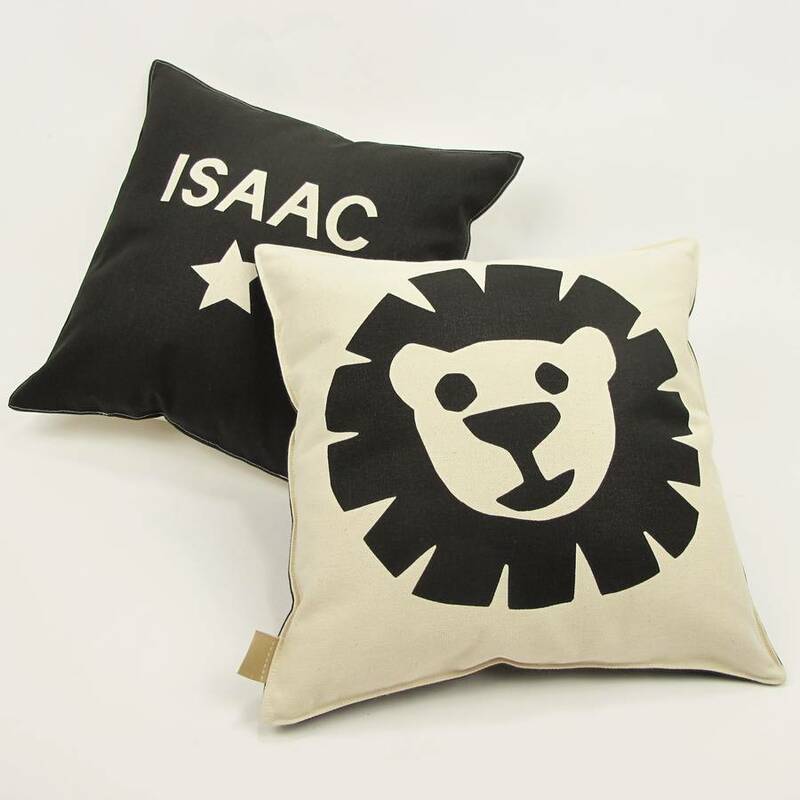 100% unbleached half panama cotton and hand-printed using non toxic water based inks. 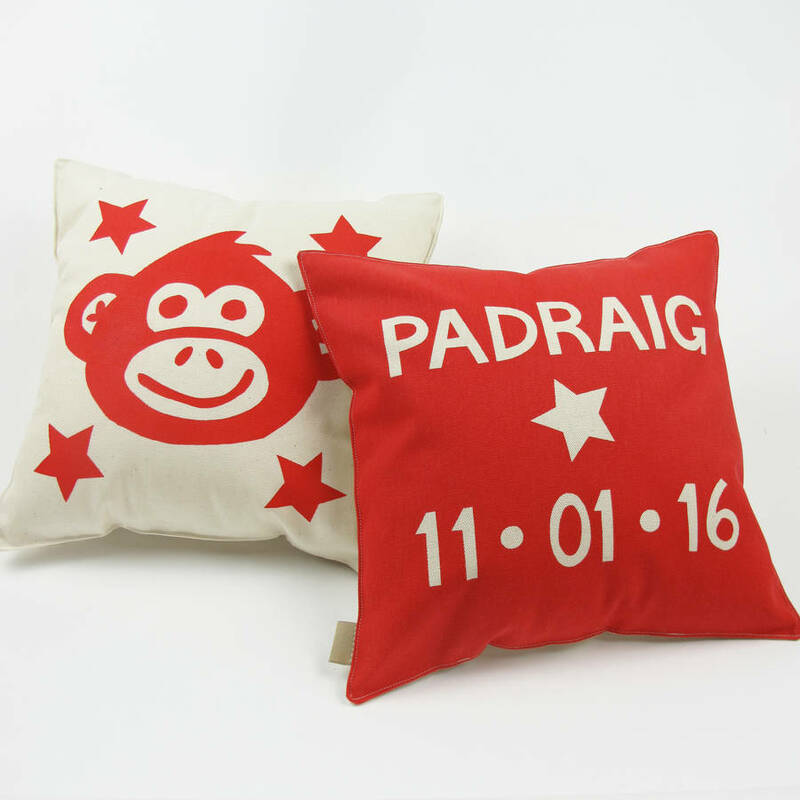 Comes with a polyfil pad - this is a fixed pillow with no opening. Care instructions: Gentle hand wash, do not spin, dry flat. Warm iron whilst slightly damp.